7th June is National Nightmare Commute Day. Fund Our Future is asking the Australian Government to commit to fast-growing outer suburbs, City of Wanneroo being one of the fastest in Australia and THE fastest in Western Australia. We require better roads, public transport and health facilities. Specifically on the 7th June they ask that you share your story about your commute to work that day. 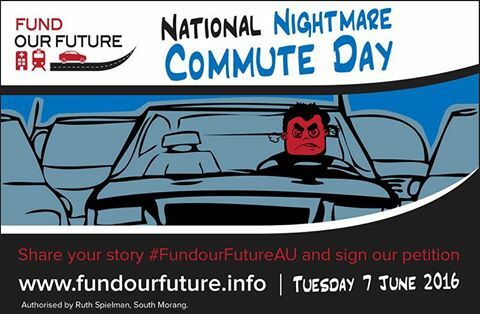 You can find out how on the facebook page for the event National Nightmare Commute Day. So for more information on Fund Our Future and what they are doing visit Fund Our Future website and take the time to register, they will send an eMail Message to the Prime Minister and Leader of the Opposition on your behalf, directly related to our region. As of today Our communities have sent 54085 emails through Fund Our Future, get involved!